You want to fuel up your blogging business, then you need to run your blog on Wordpress. WordPress is the most powerful CMS. WordPress is the best tool to launch a blog. WordPress is not just a content management system but it is the most powerful tool to launch websites. Over 30% websites are running on WordPress CMS. Today I have a big announcement about this powerful content management system. 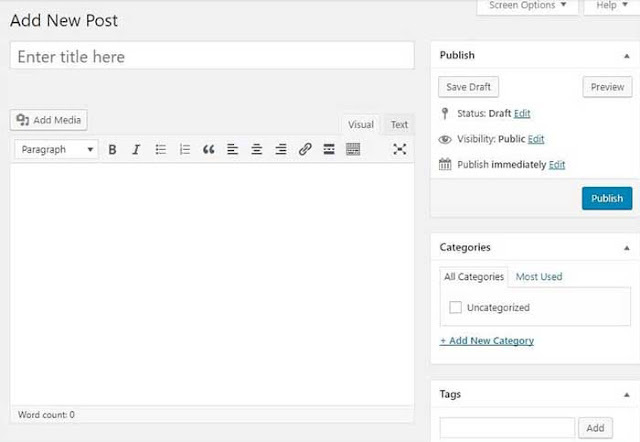 WordPress is evolving and going to give you a completely updated editing experience. It means that the traditional way of writing and editing on WordPress is going to change. WordPress is bringing this massive change to improve structuring and flexibility in writing. This massive change is known as the new Wordpress Gutenberg editor. So it is the time to understand what Gutenberg editor is and how it works as a new editor. You will also learn the details about Gutenberg editor and when you can expect it to be live. WordPress has redesigned it’s editor to make editing more fun. WordPress Gutenberg editor is there to replace the traditional WordPress TinyMCE editor. WordPress Gutenberg editor is there to make is more accessible and easier for a common user to write content creating unique content structures by using Gutenberg blocks. In case, if you are not aware about what Wordpress TinyMCE editor is, just look at the image below. If you think the change is only about the interface styling then you are wrong. The big change that WordPress Gutenberg is bringing to WordPress is the new block based editing approach. If you are running a blog or website on WordPress then you are already familiar with how traditional editor works. You have a single box to edit or write content add videos and images etc. Gutenberg is making you write content in multiple blocks. Now let me give you a clear picture about how these Gutenberg blocks will work. To give each block a different identity you can add different color to the background of the block. Do you know, what is so cool about these blocks? If you are a developer then you can write your own blocks. That means you can get rid of embed codes and short codes. For example; To add an image gallery to your post you need not to add any gallery shortcode. All you need is to simply use gallery block. Are you thinking that Gutenberg if going to eliminate the more powerful page builders? I don’t think so. Gutenberg editor is advance than the TinyMCE editor but it is not advanced enough that it can replace the powerful editors. Yet, Gutenberg editor is there to make things easy for you. The best thing about Gutenberg editor is that it will save you from using unnecessary shotcodes and you can easily create attractive pages. You can enjoy a number of functionalities of this blocks strategy. 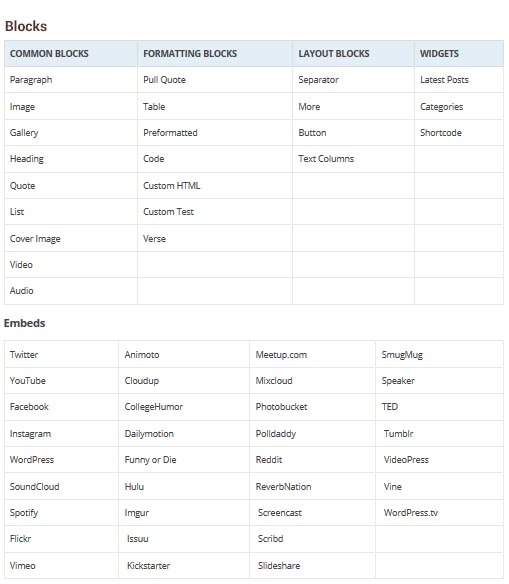 The below image tells what you can use in blocks and embeds. Right now, you can use Gutenberg editor as a plugin. But it is said that Wordpress will officially launch Gutenberg editor with Wordpress 5.0. There is no exact date that when the launch will happen. But I am sure that it will be launched in 2018. You can expect WordPress 5.0 to launch near June 2018. Are you forced to use WordPress Gutenberg editor after the release of Wordpress 5.0? There is no doubt that Gutenberg is more easy to use and flexible editor for WordPress. But you may not like it in the first go. It can take time before you become habitual of using Gutenberg editor. There is no second thought that Gutenberg will replace the TinyMCE editor in WordPress 5.0. But you can still use classic editor plugin. Add alternate links to pages and posts, so you cna access both TinyMCE editor and Gutenberg Editor. How to try the new Wordpress Gutenberg Editor now? I have already said that Gutenberg editor will be released with Wordpress 5.0. But it dosen’t mean that you cannot try it before the official release. 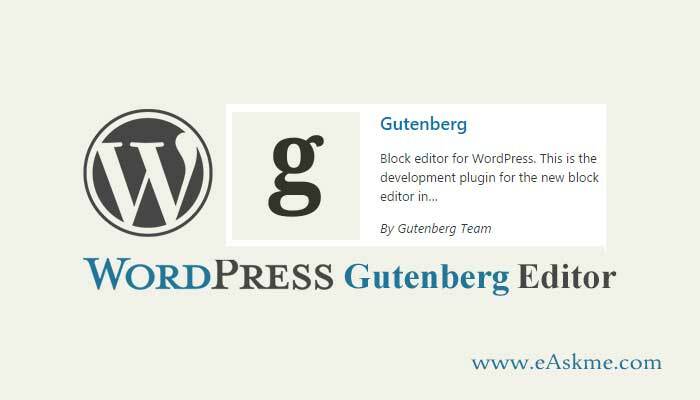 You can try Gutenberg editor by installing Gutenberg WordPress plugin. Right now Gutenberg is in beta phase, so I recommend you not to install it on your main site. You can create a local WordPress site and install Gutenberg using WAMP or XAMPP. This will help you to become familiar with Gutenberg editor before it is officially launched. Once you are comfortable with Gutenberg plugin, and then install it on your site. After installing Gutenberg plugin, it will become the default editor of your site. But this doesn’t mean that you cannot use the classic editor. You can access classic editor from drop down under “Add New” button. Gutenberg might create headache in the beginning but it will be great in long run. 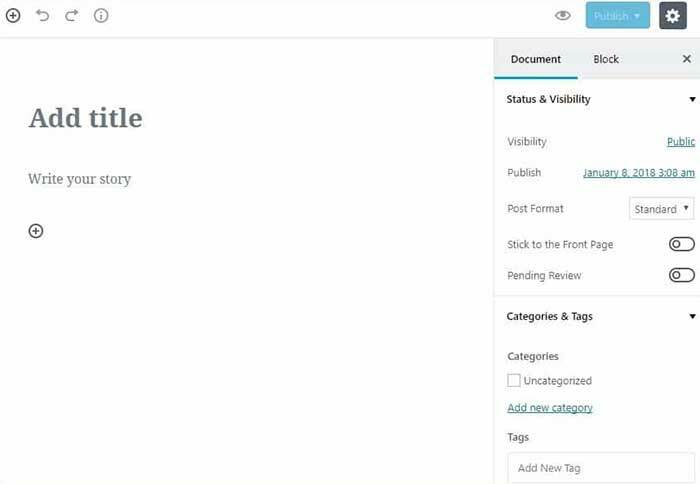 People are habitual of using TinyMCE editor and when WordPress 5.0 will release there will be a lot of noise and headache about new Gutenberg editor. Human mind takes time to learn and adapt new things. Your job is to learn and understand Gutenberg. The new editing interface will help you in long run. Soon, I will be publishing a complete tutorial about Gutenberg editor. In Gutenberg tutorial I will be talking about everything that you need to know to improve your style and writing using Gutenberg editor. Now share your thoughts with me. What do you think about the WordPress Gutenberg editor? Do you still prefer TinyMCE editor or you want to switch to Gutenberg editor? Do share your thoughts via comments.